When physical or emotional stress occurs internally, it also manifests itself externally, in skin and muscle tissue. As a result, specific points or regions can become painful, tense, sensitive, indented, etc. Oriental medicine succeeded in developing a system of therapy that uses these points not only for diagnosis, but also treatment. Acupuncture and shiatsu affects the body's internal condition by manipulating the peripheral or external tissues. The treatment results acupuncture and shiatsu achieve have been explained by oriental medicine for centuries while modern medicine is just beginning to propose explanations for their effectiveness. Endorphins: Acupuncture and shiatsu stimulate the body to produce its own pain-relieving chemicals called "endorphins", which are also known as "anti-stress hormones". Gate Control Theory: Pain is transmitted from the periphery to the brain via the spinal cord. There is a mechanism (or "gate") at work in the spinal cord, which stops pain messages from reaching the brain. The insertion of the thin needles of acupuncture or the holding pressure of shiatsu can close this gate, thus lessening the sensation of pain. Endorphins (above) can also block pain pathways by acting on these gates. Autonomic Nervous System: The autonomic nervous system is responsible for coordinating and conducting all of the body's involuntary functions. Acupuncture and shiatsu "turn on" the conserving, healing function of the autonomic nervous system while overriding the fight-or-flight function which, when overactive, puts a great deal of wear and tear on our bodies and minds. Trigger Point Theory: Through clinical research, western physicians have discovered specific points of tension in the body that, when released, are particularly effective in the alleviation of musculo-skeletal pain. The locations of these points remarkably correlate with the acupuncture points of oriental medicine. In Japan, Oriental medicine is called the medicine of vital energy. The explanation of its effectiveness is based on an energetic model rather than the biochemical model of western medicine. Ancient oriental physicians recognized that vital energy (called Ki in Japanese or Qi in Chinese) circulates along channels or meridians throughout the body and links all of the body's parts and functions. Ki maintains and nurtures our physical body as well as our mind. It keeps the blood circulating, warms the body and fights disease. When a person is healthy, Ki flows smoothly through the channels but if, for some reason, the flow is blocked, weak, or excessive, then symptoms and/or illness occurs. In treatment, the aim of the therapist is to correct the flow of Ki by inserting needles or applying pressure to specific points along the channels. In so doing, a change in part or function of the body is achieved. Changes in Ki precede physical change, so acupuncture and shiatsu can act as preventive medicine, correcting energy flow before a serious illness occurs. If physical change has already occurred, it can be reversed by adjusting the flow of Ki. "Traditional" here refers to shiatsu used as a form of Oriental medicine. Shiatsu has several different styles. One of the most respected is Shizuto Masunaga's style, which was refined from an ancient Japanese massage called anma. Classical anma is a form of Oriental medicine that is characterized by the application of manual Tonification and Sedation techniques to Kyo and Jitsu acupuncture points or meridians, principles similar to those used in acupuncture. Classical anma had almost disappeared in Japan but Masunaga revived it by combining anma principles with the three governing shiatsu techniques of vertical pressure, stationary pressure and supporting pressure. The aim of Masunaga's shiatsu is to stabilize acute or chronic disharmony in the body by 1) identifying the root cause and 2) applying Tonification and Sedation techniques to regions of Kyo and Jitsu (see below). The quality or nature of ki in a meridian line or channel is defined by "Kyo" and "Jitsu". These concepts are very similar to yin and yang. Kyo is the condition of hypo, or depleted energy while Jitsu is the condition of hyper, or excess energy. In Kyo, a depression or indentation will be felt in the region and it will be empty or cold. In Jitsu, pain or tension will be felt in the region and it will be congested or warm. Not only can acupuncture points and meridian lines be divided into Kyo and Jitsu, so can the body's constitution and stages of illness. Tonification techniques can be applied to conditions of Kyo and sedation techniques can be applied to conditions of Jitsu to help normalize them. The palpation and diagnosis of Kyo and Jitsu is not only important to shiatsu treatment, but also an essential diagnostic tool in acupuncture. 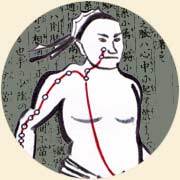 A classic Oriental medicine book states that Kyo and Jitsu must first be found in the meridian through "touching diagnosis" before administering acupuncture or moxibustion. After the treatment is completed, the same initial procedure of touching is repeated. Even though the meridian is stimulated with acupuncture or moxibustion, better results can be achieved with the addition of touching diagnosis. However, some acupuncture techniques do not employ touching diagnosis and, as a result, the needles must be inserted more deeply or in greater number in order to achieve the desired result. Tonification techniques are used to restore vital energy (ki) to an area of Kyo. A long, stationary or holding pressure is used with patience as it takes time for the nurturing warmth to reach deep inside the tissues and for strength to be restored to the area. With Sedation, or Dispersion techniques, the Jitsu area of excess or congestion is stimulated by rotary movement or short, stationary pressure. The concentration of ki is unblocked so that it can move smoothly along the meridian and the area will normalize itself. Tonification techniques are most useful in the treatment of root or underlying causes while Sedation techniques are most often employed in local treatment or the treatment of symptoms. Shiatsu treatments are generally relaxing as a deep but gentle pressure is normally used. The intensity of pressure applied is adjusted according to your condition in order to minimize discomfort. Certain areas of your body, however, may feel tender during or following the treatment. The number of treatments will vary with each individual and the condition being treated. For acute problems, only a few treatments may be required. In some cases, one treatment will be sufficient. For complex or long-standing conditions, one or two treatments a week for several weeks may be recommended with less frequent treatments necessary as improvement occurs. As in any form of healing, the patient's attitude, diet, determination and lifestyle will affect the outcome of a course of treatment. Oriental medicine is also an educational process in which the patient becomes more aware of his or her own body, thus increasing its ability to maintain well being. Ideally, acupuncture and shiatsu therapy is used as preventive medicine. Depending on each patient's lifestyle, regular weekly or monthly treatments can keep both body and mind in balance.